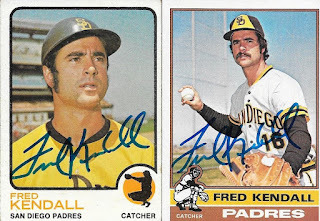 Some more 1970s cards have been returned and placed in my album, thanks to this TTM success from Fred Kendall. 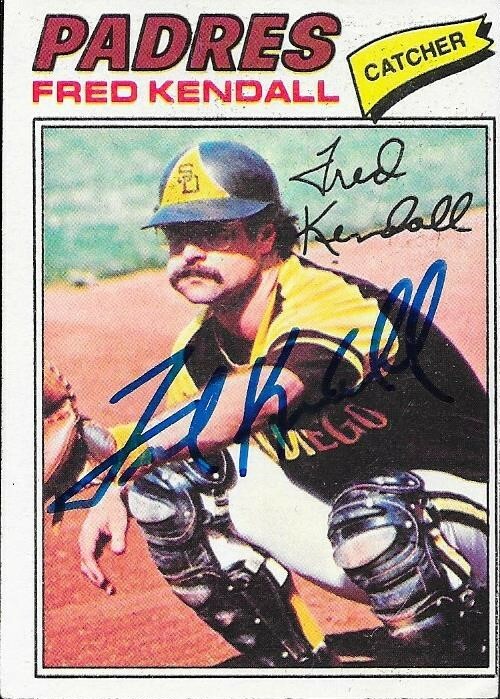 I like this 1977 Topps that has him in his catcher's gear, and ugly Padres uniform. 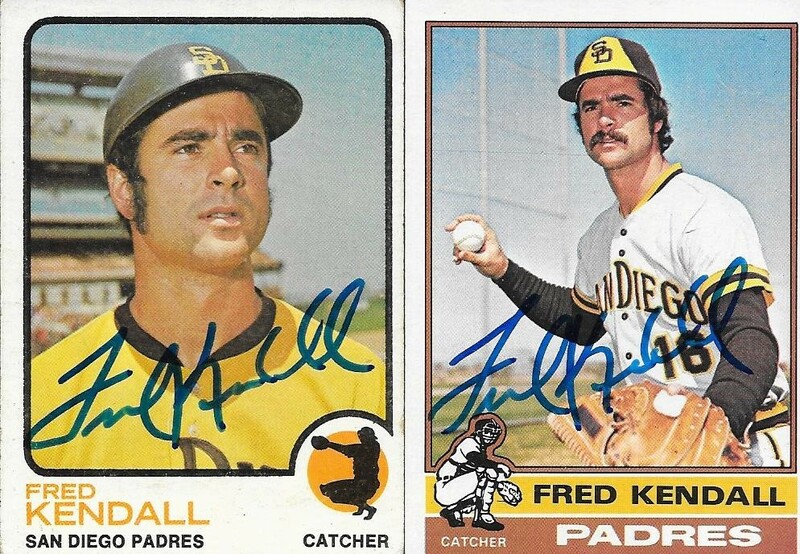 I also had the 1973 and 1976 Topps shown here, with more Padre brown shown. Kendall (b. 1949) is the father of former catcher, Jason Kendall. 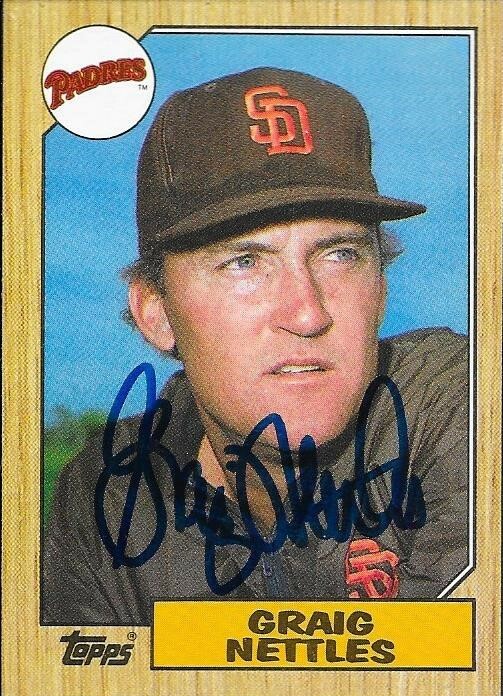 He played in the majors from 1969 to 1980 for the Padres, Indians and Red Sox. He had 603 hits, 31 home runs and a .234 batting average. I mailed to Kendall on May 24 and got the cards back on June 5, for a 12-day TAT. 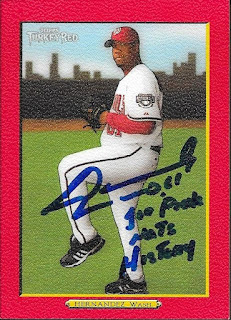 Another of the free signers at this year's National was 1997 World Series MVP, Livan Hernandez. I bought a few cards of his specifically for the show, even though I did have a few in my possession. The above Turkey Red was a nice pickup that looks great signed. He even inscribed this one 1st pitch, Nats History. I also added the Studio, and the Bowman Heritage. The middle card, 1997 World Series Heroes, was from my 1998 box that I still have here. Hernandez (b. 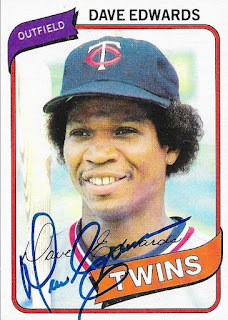 1975) played in the majors from 1996 to 2012 for the Marlins, Giants, Expos, Nationals, Diamondbacks, Twins, Rockies, Mets, Braves and Brewers. 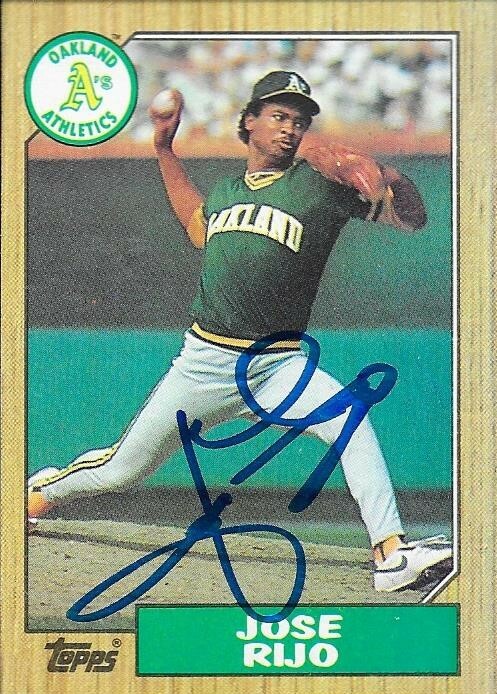 He had a career record of 178-177 with 1,976 strike outs and a 4.44 ERA. He was an All Star in 2004 and 2005 and was the runner-up in the 1997 NL Rookie of the Year voting (Scott Rolen won that year). He won the World Series in 1997 with the Marlins, picking up MVP honors in both the NLCS and World Series. 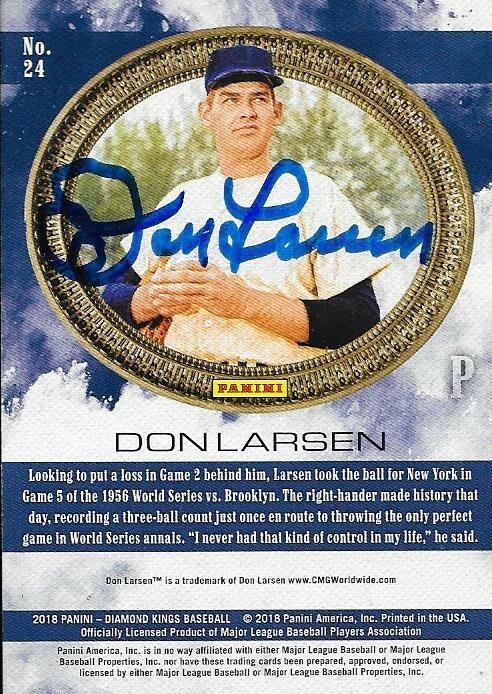 Since Don Larsen signs for a fee, I don't mind having sent to him multiple times. He always come through, and this time was no exception. 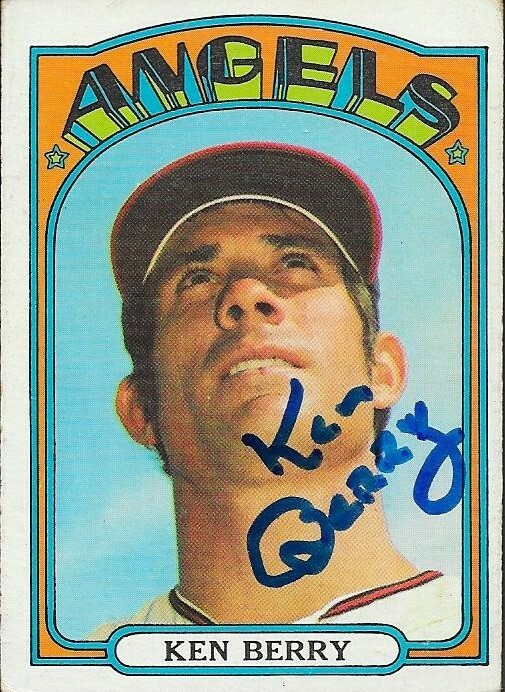 He did, however, sign the back of this Diamond Kings card. I guess he thought it looked better that way. Still, it's a cool card, and I am glad I was able to get him to sign it. 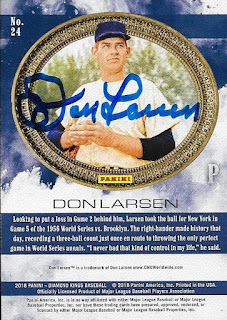 I mailed to Larsen on May 29 and got the card back on June 5, for a 7-day TAT. Before I left for the National, I caught two Wood Ducks vs Keys games with my cousin, Andreas. He came over from Germany on his vacation, and accompanied me to the National, then on to Boston. Before we left, I wanted to give him a game or two at historic Grainger Stadium, which I think he enjoyed. I was getting low on Keys stuff, since I saw them at Wood Ducks already, then another game at Mudcats. Still, I was able to get some cool stuff signed, and into my album. The above Guilder Rodriguez turned out really well. It was a card from my amazing friend, Max, and he told me to keep it in exchange for one of Rodriguez's Topps base cards from 2015. Max is the best. 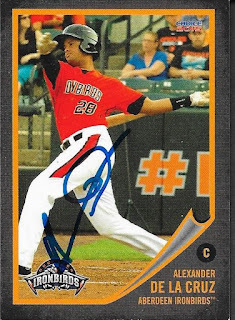 I finally got hold of Alexander De La Cruz, who had been on the DL for what seemed like all season. I got this team set card from the Ironbirds done, finally. I got a few 50/50s done for my buddy, Gerard. 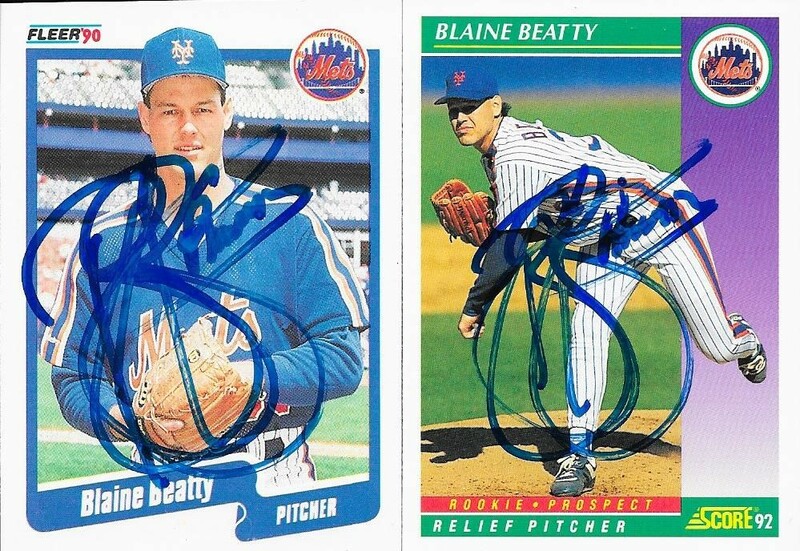 He let me keep these two Blaine Beatty cards, which I didn't have in my collection. 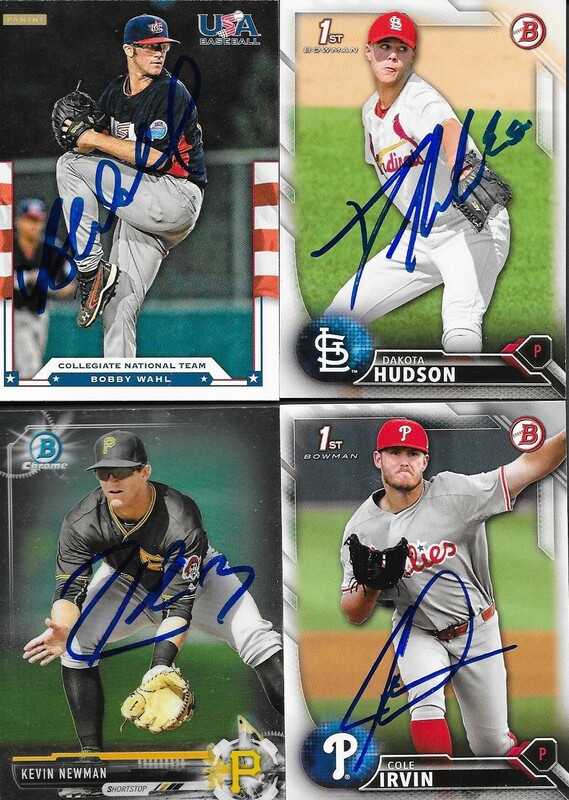 Finally, here are a few of the 2018 Hickory Crawdads cards that I was able to get signed. They have to be prepped beforehand, but turned out well. I once mailed a letter to Sammy Stewart, but I never got a response. Granted, it was to him while he was in prison, but I still hoped to get a letter back from him. Being that he was from North Carolina, and a former Oriole, I had hoped to hear from him after I reached out. He never responded. Stewart passed away earlier this year after years of trouble with the law and addiction. I had hoped that he would turn himself around, and maybe show up to Orioles Fan Fest at some point, but that was never to be. I found this card on Ebay for a decent price. I had intended to use a $10 off coupon for Ebay that I was handed at the National, but the coupon didn't work. I guess the theme of this post is - disappointment. Stewart (b. 1954 - d. 2018) played in the majors from 1978 to 1987 for the Orioles, Red Sox and Indians. He had a career record of 59-48 with 586 strike outs and a 3.59 ERA. He won the World Series in 1983 with the Orioles. He was born in Asheville and called NC home. I robbed from my vintage box again with the cards I sent TTM to Johnny Edwards. 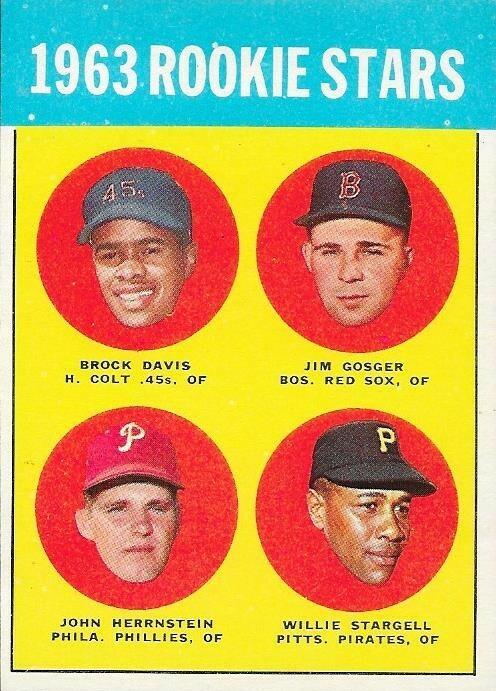 I'm glad I did, as the above 1965 Topps turned out really nicely. 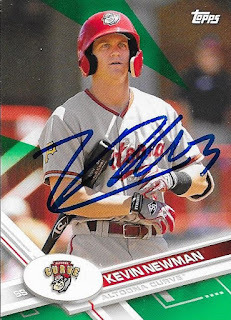 He has a really good signature, and it shows up well on this card. 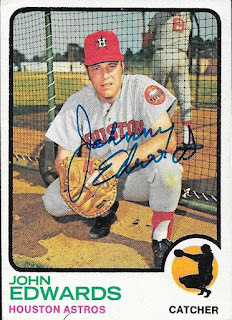 This 1973 Topps also looks great. This was one of the many that I got from Conrad from Columbia in my May purchase. 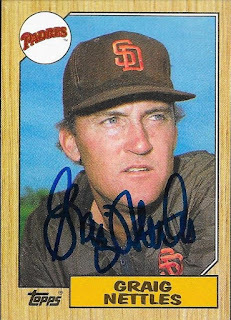 I bought a ton of 1972 and 1973 Topps off of him, and used a bunch for TTMs. Edwards (b. 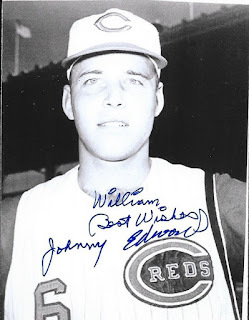 1938) played in the majors from 1961 to 1974 for the Reds, Cardinals and Astros. He had 1,106 hits, 81 home runs and a .242 batting average. He was a three-time All Star (1963 through 1965) and a two-time Gold Glove Award winner. He finished 36th in the 1969 NL MVP voting. He appeared on the 1980 Hall of Fame ballot, but did not receive any votes. 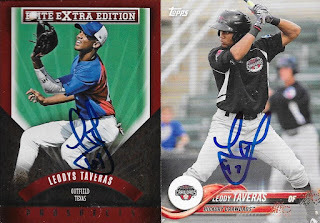 I mailed to Edwards on May 29 and got the cards back on June 5, for a 7-day TAT. He also included the below signed photos, which was a really nice touch. With all of my National posts, I fell behind on my graphing posts. 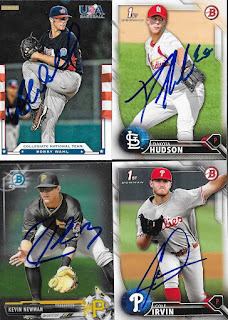 So, here are some cards I got signed when the Lynchburg Hillcats came to town right before I left for the National. I got a bunch of 50/50s done, and a few for myself. The above Stars and Stripes Justni Garza was part of a 50/50 for Gerard. I didn't have any of these, so it was nice to add one to the album. 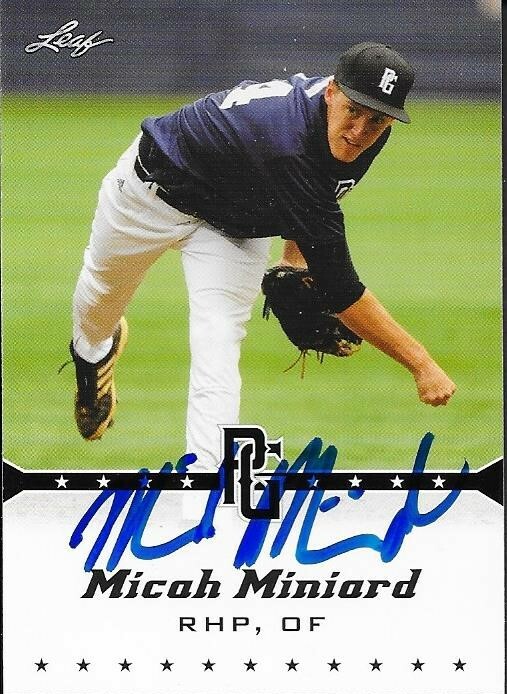 I was really happy to get a few of these 2013 Perfect Game Micah Miniard cards signed. Chris ended up with one, since I had several. I was able to get a few 2017 Bowman Ernie Clement signed. He was super nice, and ended up going on the DL right after I left for the show. 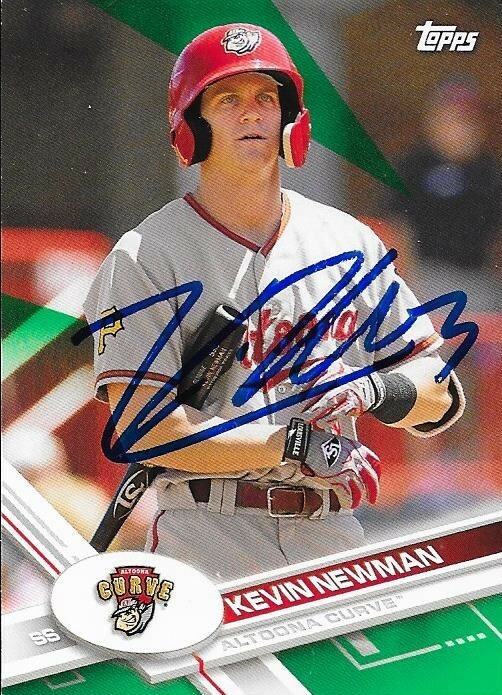 He has since been promoted to Akron, after playing only 33 games in the Carolina League. 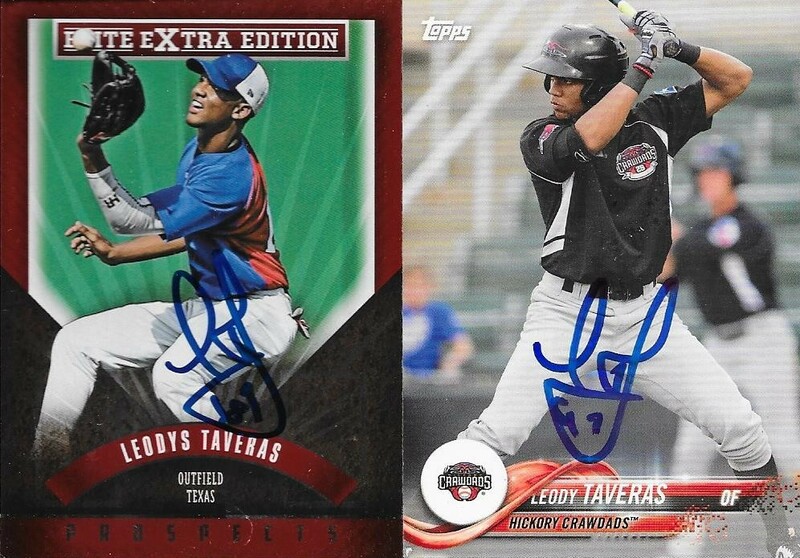 Finally, I got a few cards signed by Leody Taveras. He has been tough this year because he only signs one card per person. So many people have asked me if I can take 50/50s of him, I finally had to start refusing stuff. 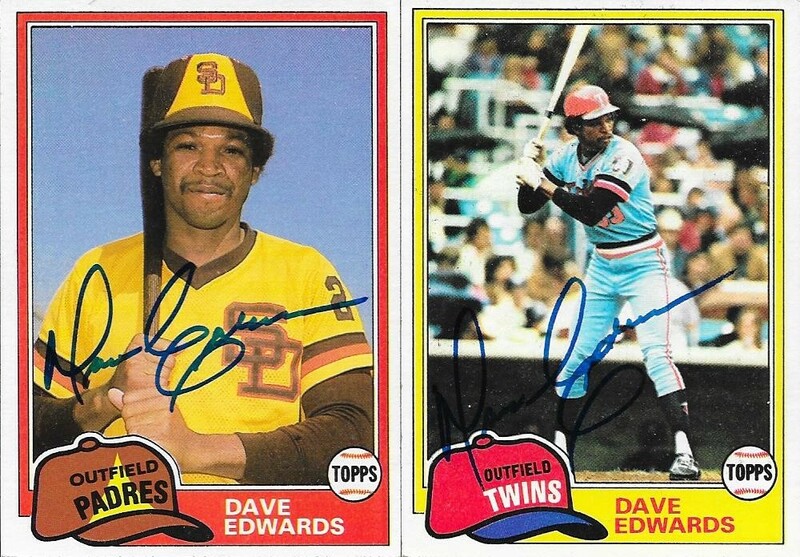 I added some early 80s cards to my album with this TTM success from Dave Edwards. 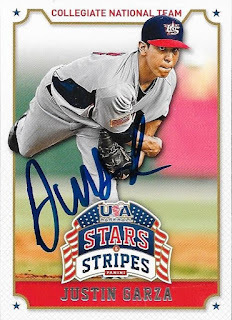 He has a really nice signature, and it shows up well on the cards. 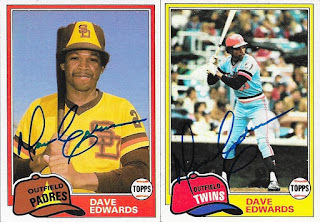 Here are two 1981 Topps that I sent. One (the Padres card on the left) is 1981 Update. Edwards (b. 1954) played in the majors from 1978 to 1982 for the Twins and Padres. He had 152 hits, 14 home runs and a .238 batting average. 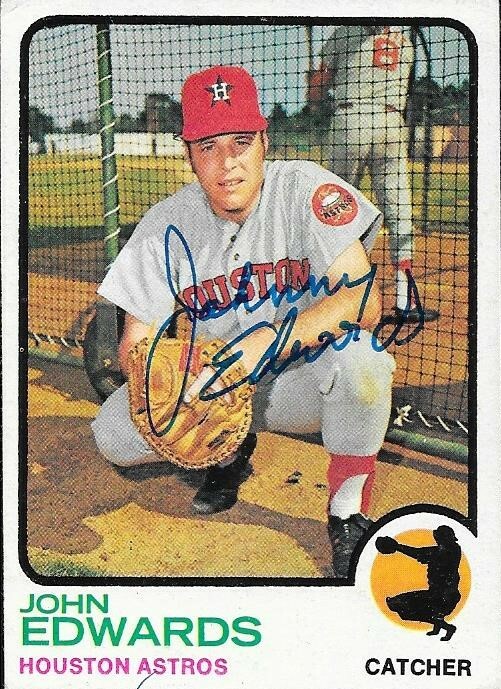 I mailed to Edwards on May 10 and got the cards back on June 4, for a 25-day TAT. This blog is much more than autographed cards and stuff like that. I still love a good vintage pickup, or building a set. 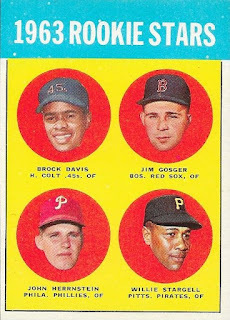 One of my big purchases at the National was something that had been on the blog wishlist for a few years - a 1963 Topps Willie Stargell RC. I got the card for around $115, and was pretty happy with it. I have seen them go for a lot more, but this one was fine for me. I have knocked a couple items off of the wishlist, and it is getting more difficult to find things to add to it, as I don't really know what I am looking for (aside from signed 1987s at the moment). I may abandon the top ten wishlist next year. I haven't decided. Another of the free signers at the National was someone else I needed for my 1987 set. 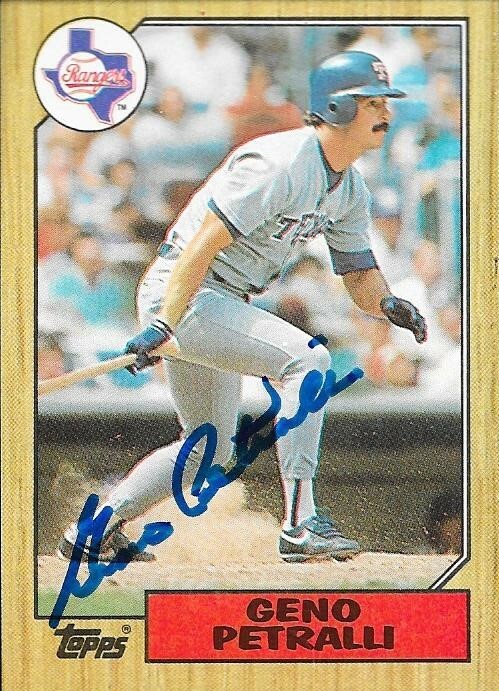 I had also picked up some other cards for Tom Browning that weren't 1987 Topps. 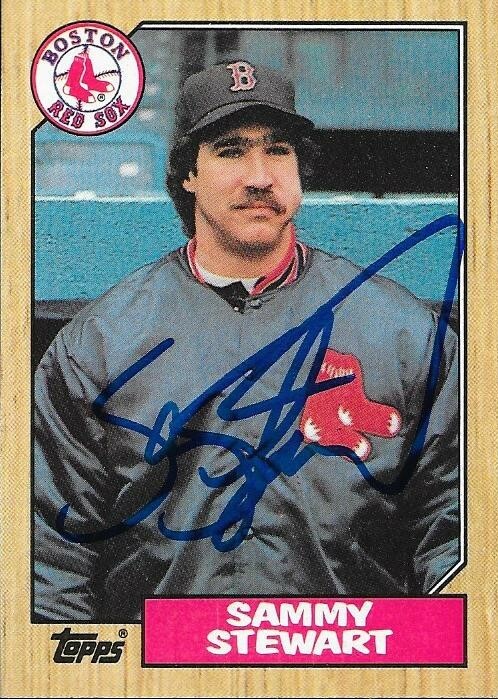 The above 1987 Topps All Star Glossy Mail-In actually was a pleasant surprise. I powdered it before the show (with the 9-pound bottle of baby powder I picked up in a Cleveland grocery store), and it turned out really well. 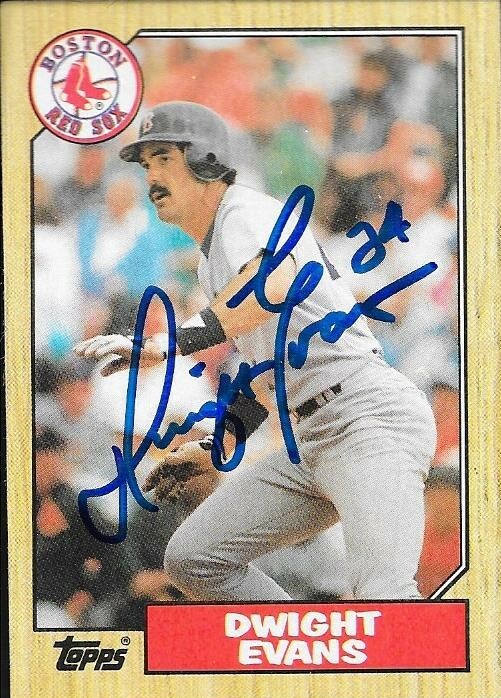 I also got a 1991 Studio signed for my good friend, Jacob (it isn't pictured), and of course this 1987 Topps. Browning (b. 1960) played in the majors from 1984 to 1995 for the Reds and Royals. He had a career record of 123-90 with 1,000 strike outs and a 3.94 ERA. 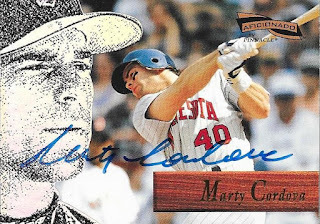 He won 20 games in 1985, the season in which he also finished second in the NL Rookie of the Year voting (to Vince Coleman) and 6th in the NL Cy Young Voting (Dwight Gooden). 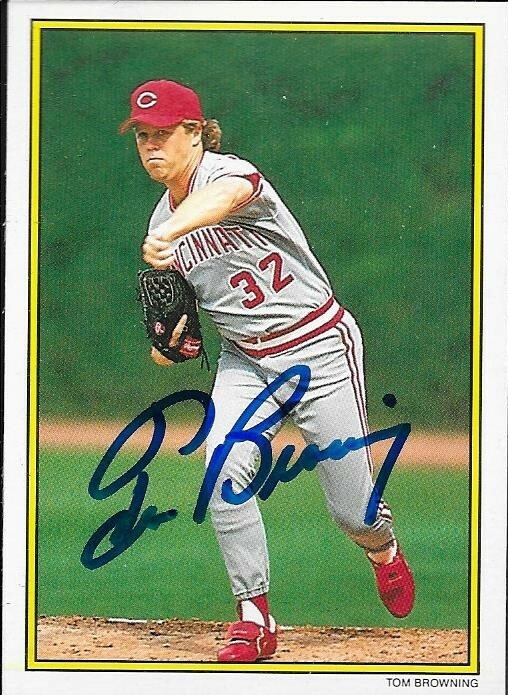 He was an All Star in 1991 and won the World Series with the Reds in 1990. He appeared on the 2001 Hall of Fame ballot and received 0.2% of the vote. It has been a while since I have added a 1962 Topps to my binder, but I got this nice one in from former Twins shortstop, Jose Valdivielso. The card actually looks cool with the ballpoint pen signature. Kind of old school, I think. Valdivielso (b. 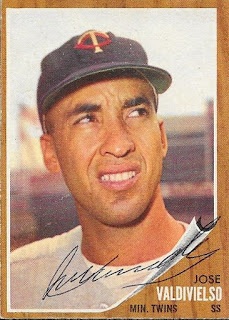 1934) played in the majors from 1955 to 1956 and 1959 to 1961 for the Senators and Twins. He had 213 hits, 9 home runs and a .219 batting average. I mailed to Valdivielso on May 25 and got the card back on June 4, for a 10-day TAT. He signed the card for a $5 donation. It took a while, and two attempts, but I finally got some cards back TTM from Kurt Abbott. I had a few nice cards that I sent along, and am happy with how they turned out. You can never go wrong with a 1995 Studio, so I was pleased this one was one I put in there. 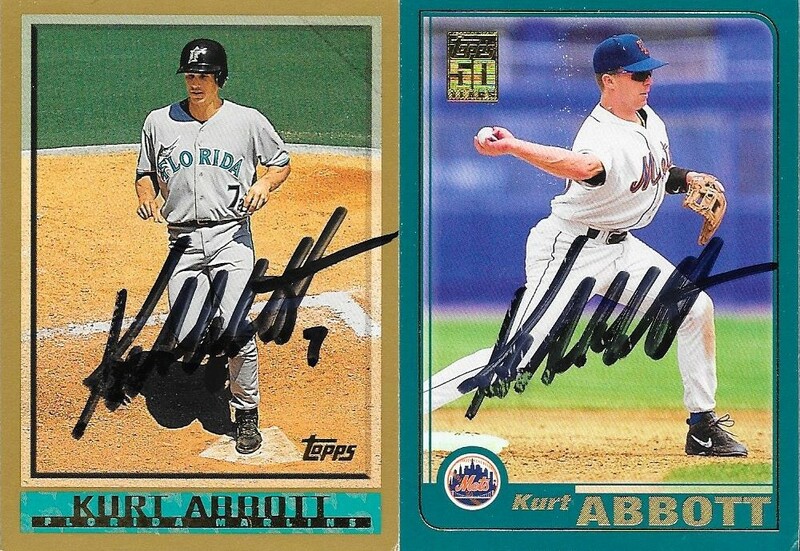 I also added these two Topps cards, a 1998 and 2001. Both look fine, even though Abbott's Sharpie is about to give out. Abbott (b. 1969) played in the majors from 1993 to 2001 for the A's, Marlins, Rockies, Mets and Braves. He had 523 hits, 62 home runs and a .256 batting average. He won the World Series with the Marlins in 1997. I mailed to Abbott for the second time after a RTS on May 25, and got the cards back on June 4, for a 10-day TAT. 2018 National Paid Signer - Ken Griffey, Sr. 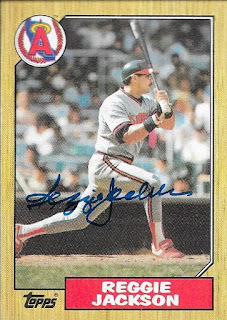 I was really excited to knock this card off of my 1987 checklist at the National. For $39, I get Ken Griffey, Sr. He wasn't very talkative, but not unfriendly. He had a cancer scare a few years ago, but looked pretty healthy at the show. Griffey (b. 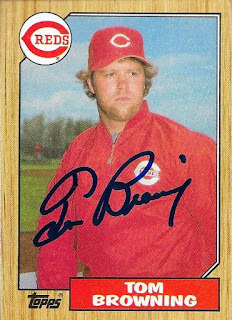 1950) played in the majors from 1973 to 1991 for the Reds, Yankees, Braves and Mariners. He had 2,143 hits, 152 home runs and a .296 batting average. He was a three-time All Star (1976, 1977 and 1980). His best MVP finish was 8th in 1976 (NL). He won the World Series in 1975 and 1976. He appeared on the 1997 Hall of Fame ballot and received 4.7% of the vote. 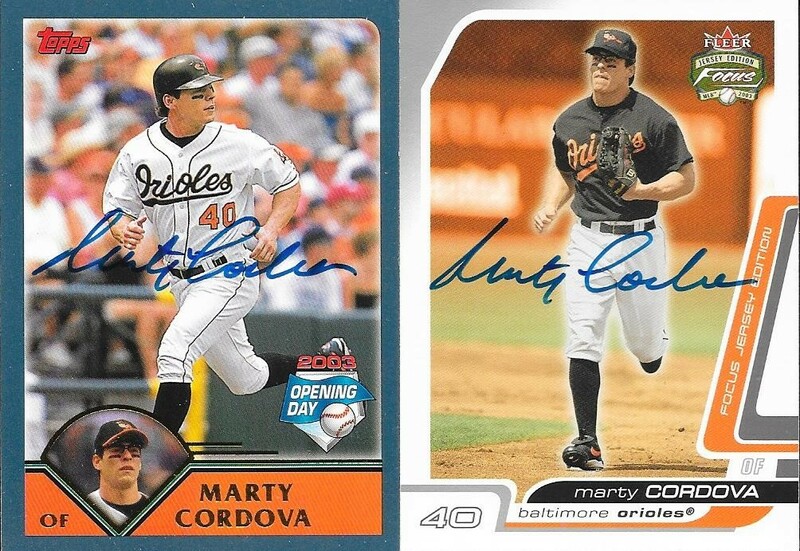 I had gotten Marty Cordova TTM a while back, so when I saw that he was a free signer this year at the National, I had no cards of his. So, I went on Ebay and bought a couple that I thought would look cool in my album. 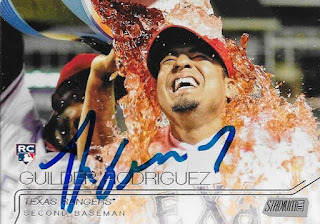 The above 2002 Topps Pristine turned out awesome. It is numbered 21/70 and has perforated edges. It looks really awesome in person. I ended up with extra Cordova vouchers, but no enough cards, so I found these two in a dime box and they turned out awesome, as well. 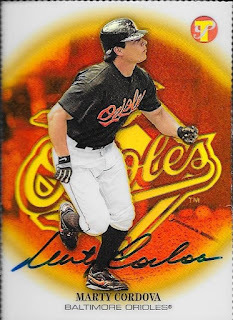 I especially liked the 2003 Topps Opening Day, since I didn't have any in my album. 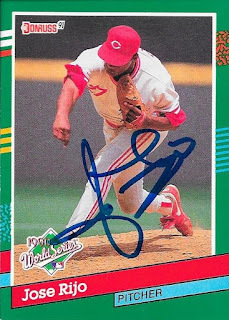 Back to the cards I ordered; I really have wanted a 1996 Pinnacle Aficionado signed for a long time. I want to build the set and put it in an album at some point, but they are really tough to find. I'm just happy that I got this one signed, and it is now in my autograph album. 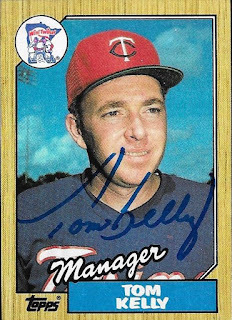 Mare 1987 Topps are coming off of the checklist, and this one was a nice TTM success from former Twins manager, Tom Kelly. Kelly (b. 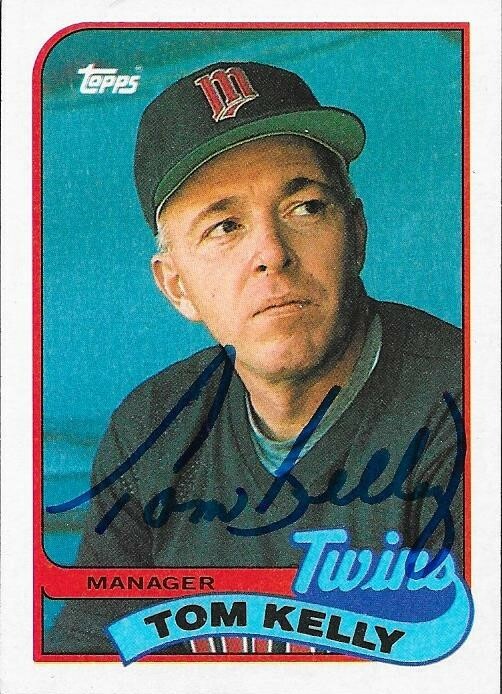 1950) played in the majors in 1975 for the Twins. He had 23 hits, 1 home run and a .181 batting average. 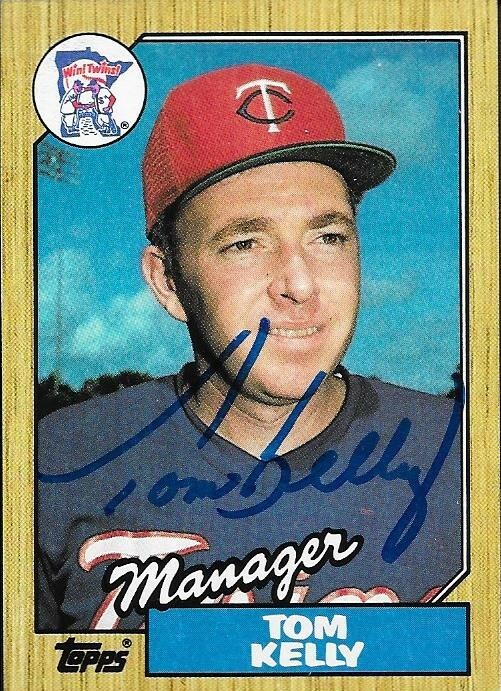 He managed the Twins from 1981 to 2001 to a record of 1,140-1,244 (.478%). He won the World Series with the Twins in 1987 and 1991. He was the AL Manager of the Year in 1991. I mailed to Kelly on May 25 and got the cards back on June 4, for a 10-day TAT. I took part in another private signing through Sportscollectors.net that got me the legendary Graig Nettles. 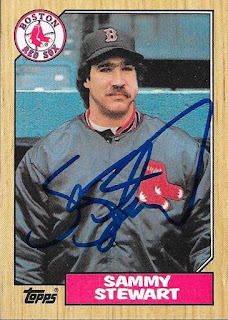 I definitely needed him on my 1987 Topps, but since the price was fairly decent, I decided to also send along the above 1981 Topps. Nettles was one of those players that I thought I wouldn't be able to get, and then the private signing came along at a good time. Nettles (b. 1944) played in the majors from 1967 to 1988 for the Twins, Indians, Yankees, Padres, Braves and Expos. He had 2,225 hits, 390 home runs and a .248 batting average. He was a six-time All Star (1975, 1977 through 1980 and 1985). 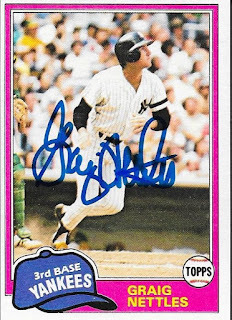 He won the World Series with the Yankees in 1977 and 1978 and was the ALCS MVP in 1981. His best MVP finish was 5th in 1977 (AL). Nettles appeared on four Hall of Fame ballots (1994 through 1997) but only received at most 8.3% of the vote. 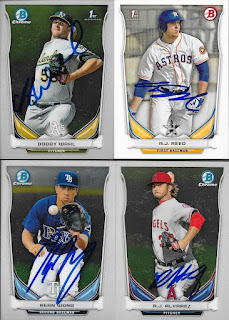 I mailed to the private signing on May 3 and got the cards back on June 2, for a 30-day TAT. I paid a fee of $15/card. I continued on with my 1987 Topps theme when I bought a voucher to meet Dwight Evans. He has two cards in the 1987 set, but my good friend, Gerard, hooked me up with one. 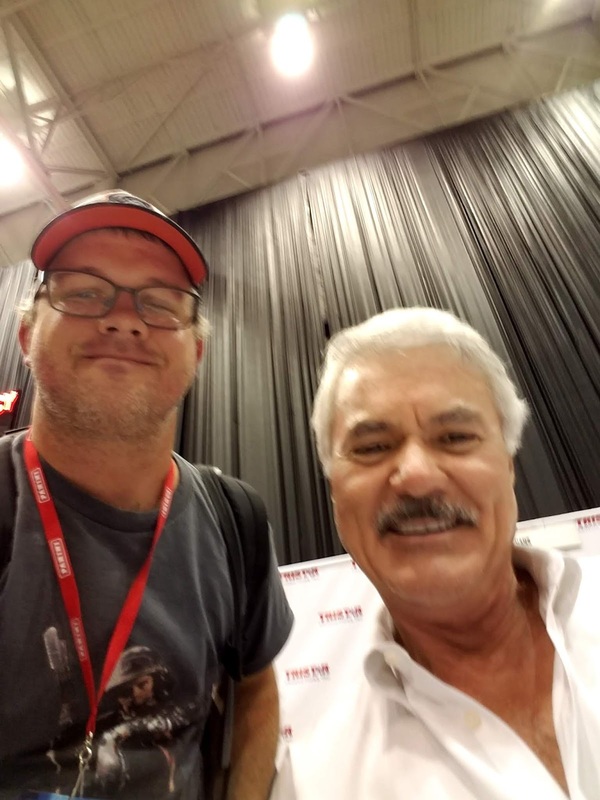 Evans also was cool enough to do a selfie with me, which was nice! Evans (b. 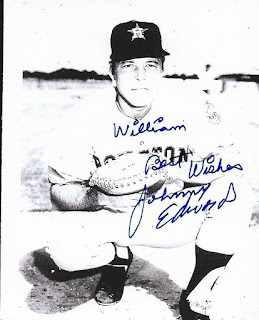 1951) played in the majors from 1972 to 1991 for the Red Sox and Orioles. 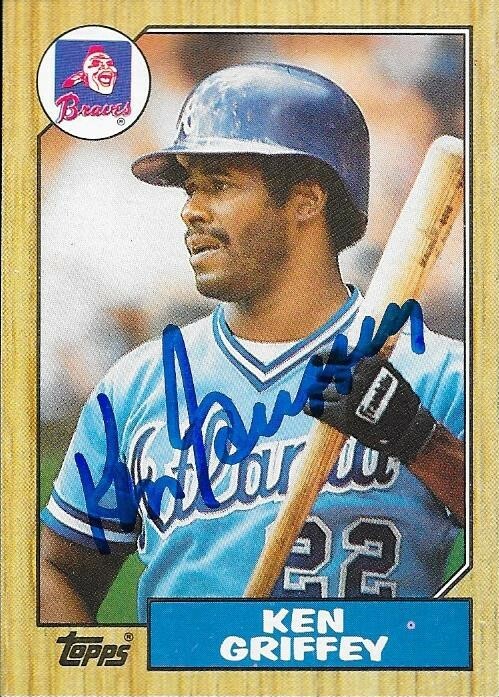 He had 2,446 hits, 385 home runs and a .272 batting average. 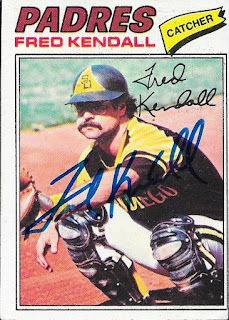 He was a three-time All Star (1978, 1981 and 1987) and an eight-time Gold Glove Award winner (1975, 1978, 1979, 1981 to 1985). His best finish in the AL MVP voting was third in 1981. Surprisingly, Evans only appeared on three Hall of Fame ballots between 1997 and 1999. He only received a maximum of 10.4% of the vote in those three years. He may not be a Hall of Famer, but surely, he should have received more of a look. Each year at the National, I try to meet/get an auto of at least one "big name". This year, with me concentrating on cards for my 1987 set, I set out to add as many as I could, and also maybe save room for that big name. So, since he had two cards in the set, I went for Reggie Jackson. I was torn between Reggie, Dave Winfield and Rickey Henderson. Winfield has one card in the set, while Rickey has three. I figured I ought to wait a bit on Rickey, especially since Don Mattingly is on a card with him. 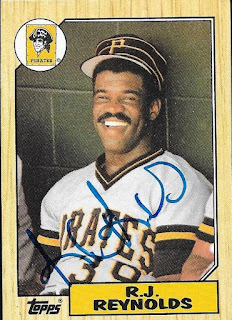 Maybe I can get Mattingly first TTM, then get Rickey in person so I don't have to mail an already signed card TTM. Because I had two paid vouchers for Reggie, I thought I would ask my buddy, Nate, if he wanted to go through the line with me. I figured that Nate was on a much tighter budget than I was, so a free meeting with a legend might be fun. He jumped at the chance, so he went through the line with me and got my above 1987 Topps signed for me. I've heard all kinds of horror stories from collectors all around that Reggie wasn't too pleasant to deal with. He was super nice for Nate and I, so I can only base things on my own interaction. I was really glad he was cool, because you never want to think negatively about anyone, really. I was really happy to meet Reggie, and knock these two tough cards off of my checklist. I'm acually pretty excited at who the next huge names to fall off of the checklist will be. Back in May, I bought a huge lot of 1972 and 1973 Topps from Conrad in Columbia. The purpose was two-fold. 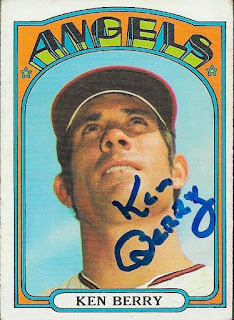 I wanted to get a jump on the 1972 Topps set, and I also wanted some bulk 70s cards that I could send TTM. A bunch of them have come back, and a bunch more are sitting in my box ready to mail out. 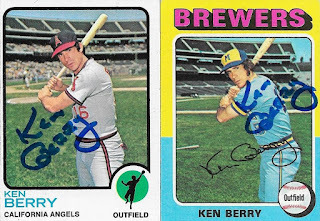 The Ken Berry cards that I got back turned out really nice. 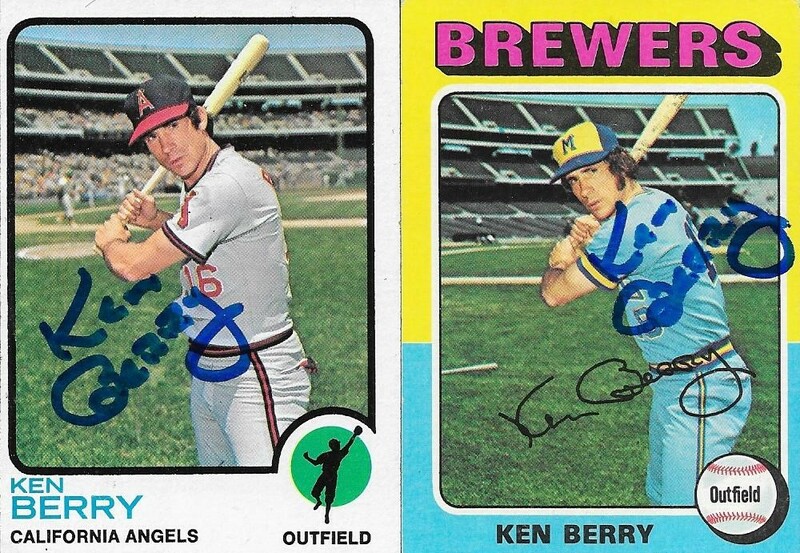 I also got a bunch of 1973 Topps, and was able to find Berry in that, as well. 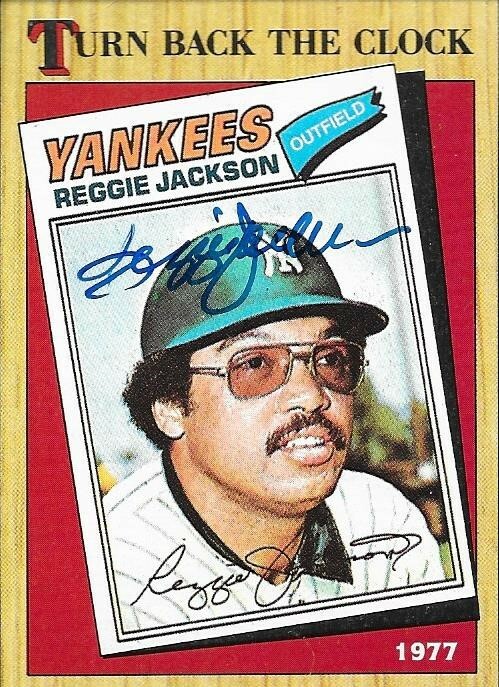 It was also nice to see that I had him among my 1975 Topps that I have left over. Berry (b. 1941) played in the majors from 1962 to 1975 for the White Sox, Angels, Brewers and Indians. He had 1,053 hits, 58 home runs and a .255 batting average. 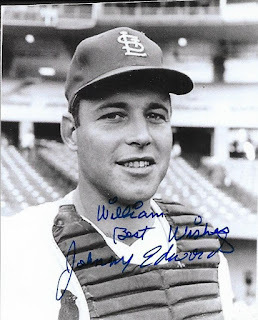 He was an All Star in 1967 and won the Gold Glove Award in 1970 and 1972. He appeared on the 1981 Hall of Fame ballot, but received no votes. 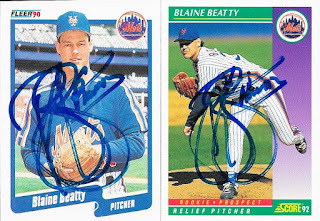 I mailed to Berry on May 24 and got the cards back on June 2, for a 9-day TAT. I don't see him as much as I would like to these days, but I know that my great friend, Max, is around, and he is thinking of me. 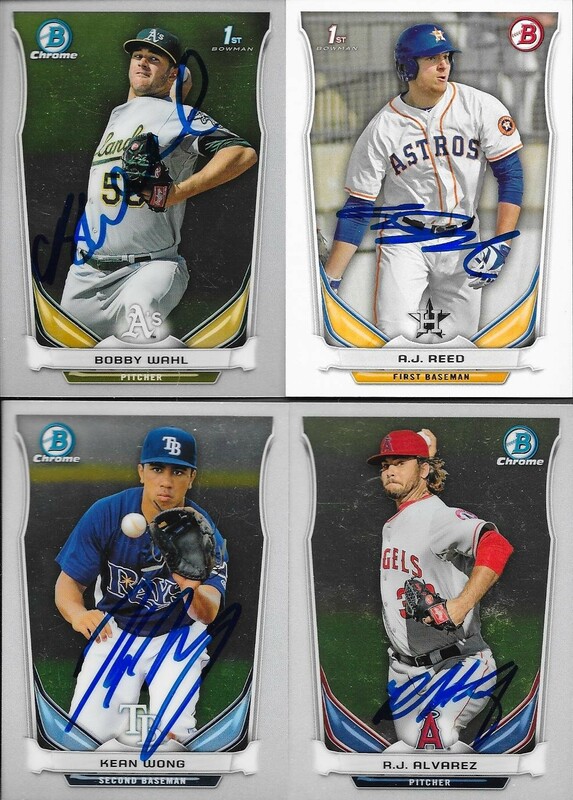 He has helped me get so many autos lately, I alwas appreciate a care package from him. He messaged me recently looking for guys who would be at the AAA All Star Game. I sent him a bunch of cards, and like always, Max sent me a bunch back signed. We were both disappointed that some of the bigger names elected not to go to the game, but Max still came away with some really nice stuff. Former Orioles first rounder, DJ Stewart was one of the players I was able to send Max who had a bunch of cards. Max was able to get a few of them signed, and sent these three back. Here are some others that he was able to send me. All of the cards turned out really well. 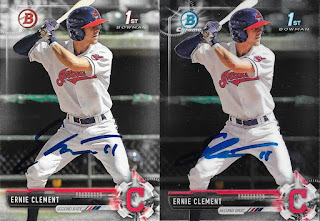 I was happy to help him locate the cards, as I was able to pull a bunch from my Bowman box, and make room for some new stuff. Finally, Max came through again and knocked a card off of my 1987 set. This one was Geno Petralli, and looks sharp. Thanks so much, Max. You're one of my favorite people, and I know that even though we don't talk every day, we are still here for each other. I took advantage of another private signing on sportscollectors.net that got me this signed 1987 Topps RJ Reynolds for my set. Reynolds (b. 1959) played in the majors from 1983 to 1990 for the Dodgers and Pirates. He had 605 hits, 35 home runs and a .267 batting average. I mailed to the private signing on April 24 and got the card back on June 1, for a 38-day TAT. I paid a fee of $10.00. 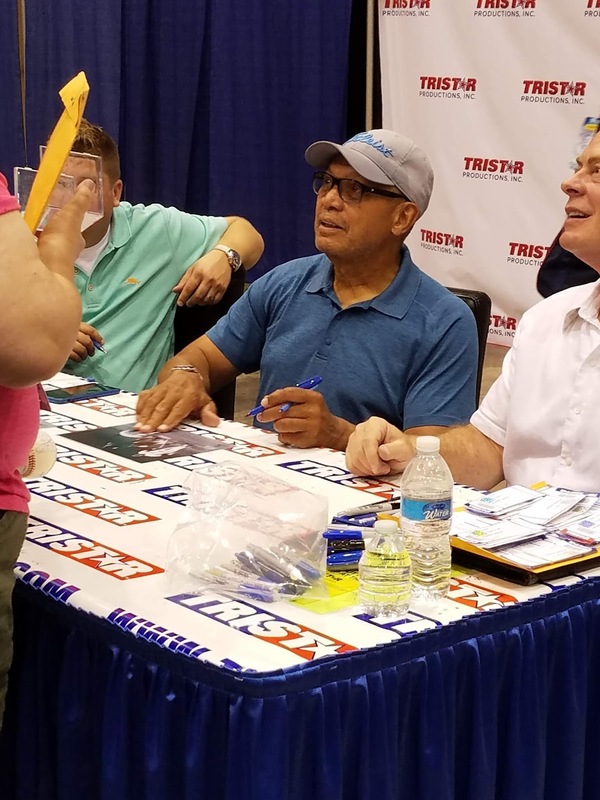 One of the free VIP signers during the 2018 National was Jose Rijo. 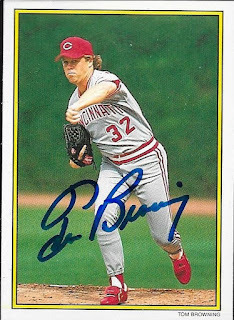 He was a pretty dominant pitcher when I was growing up, and I was happy to get his autograph on a few cards. I was even happier that he was one of the signers there who was in the 1987 set, so this was another card I could knock off of my checklist. Rijo (b. 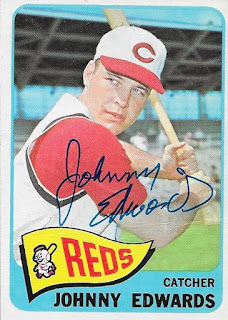 1965) played in the majors from 1984 to 1995 and 2001 to 2002 for the A's and Reds. He had a record of 116-91 with 1,606 strike outs and a 3.24 ERA. 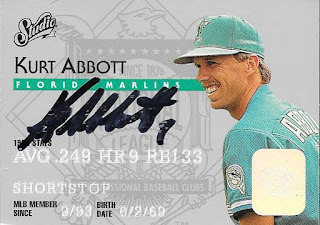 He led the league in strike outs in 1993 (NL) with 227. 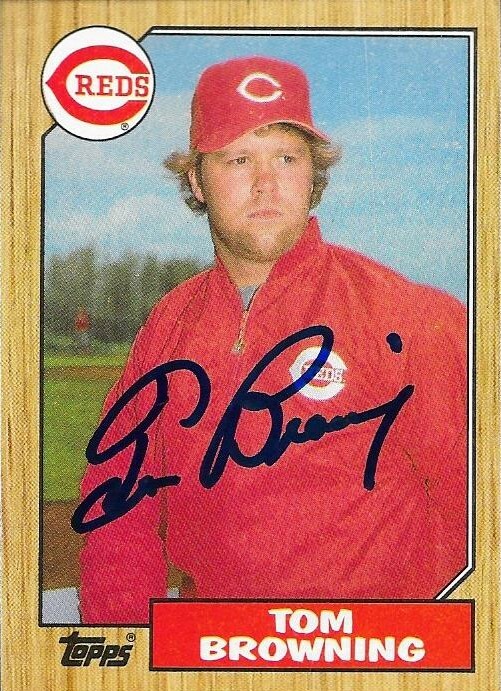 He won the World Series with the Reds in 1990. His best finish in the Cy Young Award race was 4th in 1991. He was an All Star in 1994 and finished 19th in the 1990 NL MVP voting. 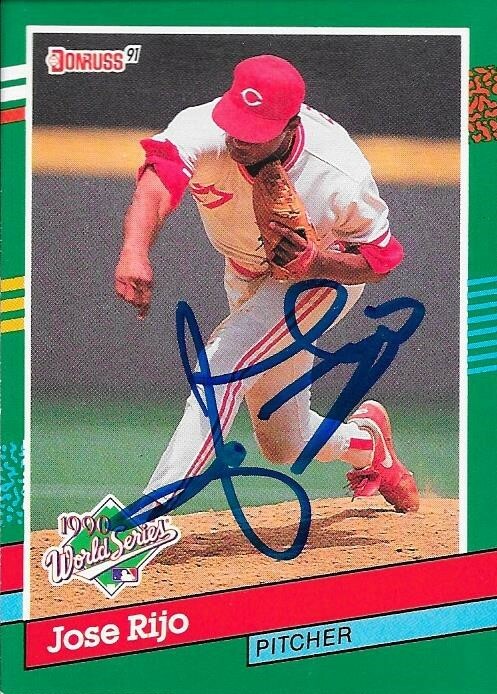 He was the MVP of the aforementioned 1990 World Series when he went 2-0 with a 0.59 ERA. He appeared on two Hall of Fame ballots (2001 and 2008) but only received a high of 0.2% of the vote.